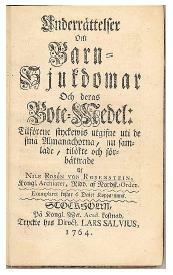 The title page to Nils Rosén von Rosenstein's The Diseases of Children and Their Remedies. The book includes advice for feeding infants, preventing disease in children, and curing some common illnesses. Its publication established Rosenstein as a pioneer in pediatrics.